Vacant Lot on Ridgeway Dr By the Beach! We Have an App For That!! 846 Fairway Dr - NEW 2018 Golf Course front by Schlabach Builders! 3381 Apple Valley Drive Video walk through! Big Ranch! 9 Grand Ridge Court - Video! Beautiful Full Time or Vacation Home. NEW RANCH at Apple Valley Lake! Video! New vacant golf course lot! Over an acre! 424 Baldwin Dr walk through video | New lakefront! Apple Valley Singer's | July Concert Promo! 547 Glenmonte Dr - New Ranch at Apple Valley Lake! New Directions Ladies Night Fundraiser Results! Lunch at the Beach Fundraiser ! Open house at Moose Lodge 252 - Sunday 5/6 1-3pm. 629 Highland Hills -VIDEO TOUR! New Listing! Lake View "Beach House" Video Tour! 573 Highland Hills - Lakefront VideoTour! Pantone Color of 2018 is announced! Dont have the space for a pool table? Now you do! 7 Tips When Considering a Lakefront Home! Opening up the Lake House! Living On The Lake in The Off Season! Our Pick!! Top 5 Family-Friendly Homes For Sale at Apple Valley! Spring Clean at the Lake! Businesss yesterday and today ...or.. YOUR way! Home Buyer Tips - Worth The Read! Ways to rack up savings via Apps! AVL Logo - Did you know? DRONE: 5 Fairway Court Golf Course Front! Supermoon Lunar Eclipse over Apple Valley Lake? Go away Clouds! About to Hit the market today! 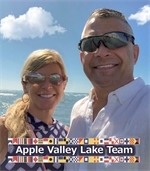 Toth and Team - Apple Valley Lake Team! When To Buy a Boat? Apple Valley Lake is one of the top places to retire to! The Historic Mount Vernon and its Homes!